27 weeks - 10 weeks to go! The order was reversed this week, so I didn't get the sonogram results until this morning. BPP/Non-Stress Test The BPP (bio-physical profile) went well, the testing nurse does a quick sonogram to look for fluid levels, baby movement, baby leg movement, and breathing movements. She passed all those areas with flying colors. The non-stress test is when they hook me up to monitors to watch the baby's heart rate and contractions. No contractions (good!). They want the baby's heart rate to increase during activity, so the nurse came in at one point and started clapping over my belly and talking really loudly. It did the trick, and was very entertaining as well! OB Appt - went well, we met Dr. Robertson who I will see for the majority of my weekly check-ups. I got the H1N1 shot, they've been seeing cases of it around here so I didn't want to take any chances being extremely high risk already because of the surgery. I had some plastic sutures sticking out from my incision that were driving me crazy, so she cut those off for me. My weight is holding steady for about the last month, although I don't know how since we eat out a lot more than usual here, and have almost zero activity level. My theory is all my muscles are wasting away, so the fat is just replacing the mucsles. My recovery after Ruth is born will be interesting! Sonogram - Since a tech does the sonogram we don't get the results right away, but I've got pretty good at watching and are able to tell the key areas. 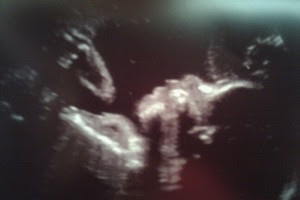 As far as I could tell, the baby's ventricles (in her brain) looked about the same, and my cervix looked about the same. I already knew the fluid levels were good from the earlier bpp. But I called up to the Fetal Treatment Center and talked to Rachel awhile this morning. She gave me the official stats - 11.5 fluid, 3.6 cervix, 14mm ventricles. They didn't look at the hind brain herniation, they don't do detailed measurements until 2 weeks from now, then again in early August. Rachel reminded me that the sonogram doesn't mean much right now, we will know a lot more after Ruth is born and she has her first solo MRI. Matt and the girls are coming next week, I am so excited! It will be hard not to be able to keep up with them, but I think just being around them will help me so much. I was reminded by Rachel not to over do anything while they are here, and Matt does a good job of reminding me as well. Being away from them has got to be one of the hardest things I've ever done. I've never been away from them for more than a 2 or 3 days, and even that is pretty rare. By the time I see them next week, it will have been a month!! I"m so glad the girls get to see you....I can't even imagine! What a TREAT that will be for all of you!